2017 Lowe SF232 Sport Fish Chase big fish or soak up major rays: The Lowe Sport Fish 232 pontoon boat is well outfitted for both. Plush dual bow chaise lounges offer a great place to kick back, while aft pedestal seats let anglers get down to business. 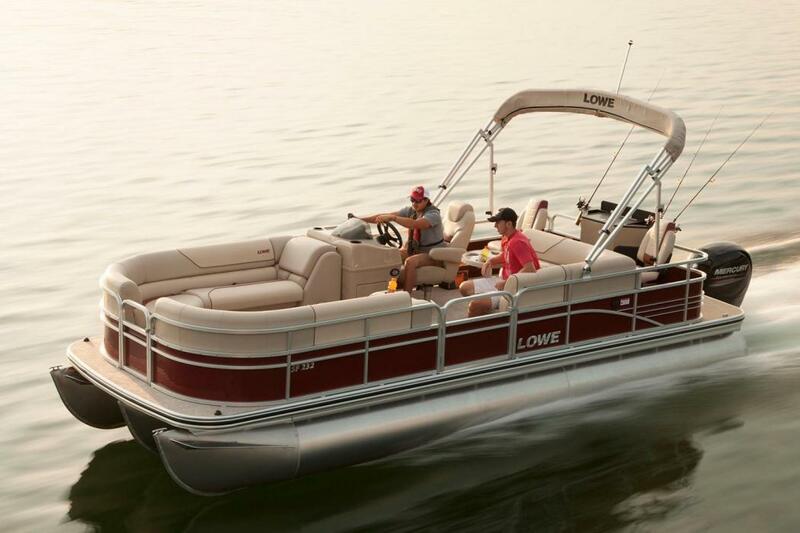 The top fishing pontoon boat specifically designed for anglers and watersports enthusiasts features legendary, durable Lowe constructionfor good times that last and last. Please note: This boat model may or may not be in-stock. A Nationally Advertised Price, if listed, may change without notice or include accessories not fully described herein. Please contact your local, authorized dealer for exact details on model availability and package pricing. 2016 Lowe SF232 Sport Fish Chase big fish or soak up major rays: The Lowe Sport Fish 232 pontoon boat is well outfitted for both. Plush dual bow chaise lounges offer a great place to kick back, while aft pedestal seats let anglers get down to business. The top fishing pontoon boat specifically designed for anglers and watersports enthusiasts features legendary, durable Lowe construction—for good times that last and last. Please note: This boat model may or may not be in-stock. A Nationally Advertised Price, if listed, may change without notice or include accessories not fully described herein. Please contact your local, authorized dealer for exact details on model availability and package pricing. 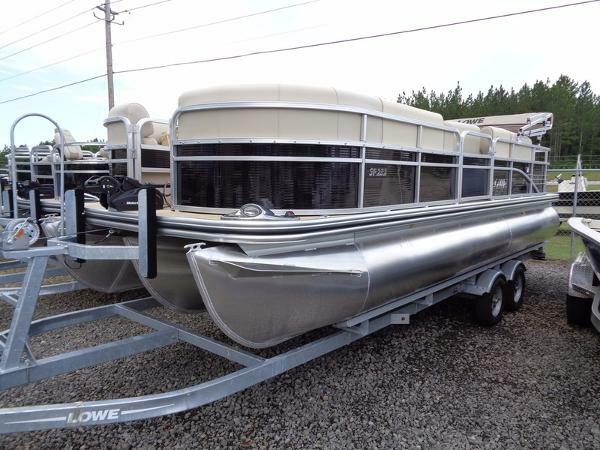 2017 Lowe SF232 Sport Fish Additional Options: Ski Tow, Marine Audio Stereo App, Custom Reclining Helm Seat w/Slider, Double Bimini Top, Custom Fit Snap On Cover, Full Vinyl Flooring, Hydraulic Steering, Pop Up Privacy Curtain, Under Seat Live Well, XL Tritoon Package. Color- White Chase big fish or soak up major rays: The Lowe Sport Fish 232 pontoon boat is well outfitted for both. Plush dual bow chaise lounges offer a great place to kick back, while aft pedestal seats let anglers get down to business. The top fishing pontoon boat specifically designed for anglers and watersports enthusiasts features legendary, durable Lowe construction—for good times that last and last. Please note: This boat model may or may not be in-stock. A Nationally Advertised Price, if listed, may change without notice or include accessories not fully described herein. Please contact your local, authorized dealer for exact details on model availability and package pricing. 2016 Lowe SF232 Sport Fish Chase big fish or soak up major rays: The Lowe Sport Fish 232 pontoon boat is well outfitted for both. Plush dual bow chaise lounges offer a great place to kick back, while aft pedestal seats let anglers get down to business. 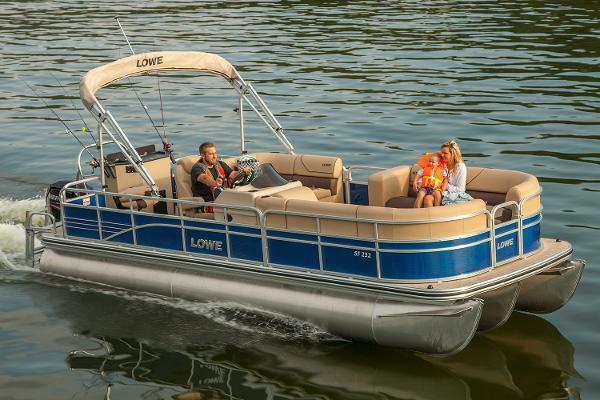 The top fishing pontoon boat specifically designed for anglers and watersports enthusiasts features legendary, durable Lowe constructionfor good times that last and last. Please note: This boat model may or may not be in-stock. A Nationally Advertised Price, if listed, may change without notice or include accessories not fully described herein. Please contact your local, authorized dealer for exact details on model availability and package pricing. 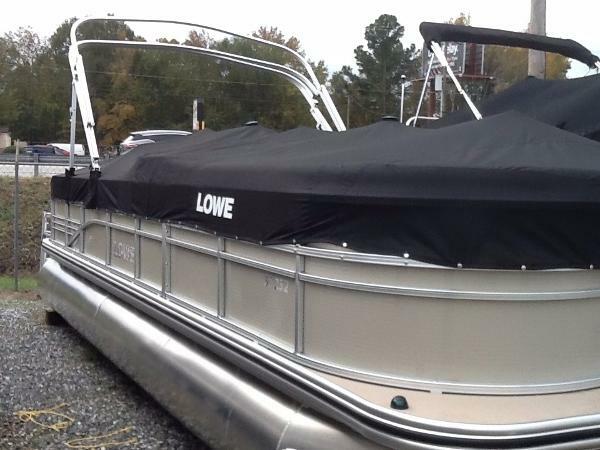 2015 Lowe SF232 Sport Fish This boat model may or may not be in-stock. 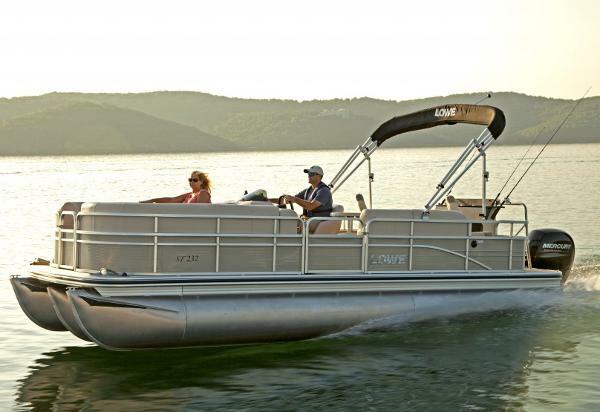 Please contact your local, authorized dealer for more information Chase big fish or soak up major rays: The Lowe SF232 pontoon is well outfitted for both. Plush dual bow chaise lounges offer a great place to kick back, while aft pedestal seats let anglers get down to business. And durable Lowe construction means the good times will last and last. Features include: 25” diameter high-buoyancy pontoon logs w/ full-width cross members and full keelCapacity for 12 family members or fishing buddiesFiberglass reinforced acrylic console w/ tach, speed, fuel & trim gaugesBarrel helm seat w/ swivel & slider2 pedestal fishing seats2 plush bow chaise loungesJensen® MS30 Bluetooth-ready AM/FM stereo w/ speakersRound pedestal table w/ 2 cup holdersStern entry w/ heavy-duty boarding ladderHeavy-duty 9' Bimini top in choice of 3 colorsOPTIONAL FISHING FEATURES: Fish Station w/ livewell; Lowrance Elite or Mark-5x fishfinder Lowe factory packaged boats are available with various horsepower Mercury® outboards. Standard equipment and options may vary from model to model.